When the Civil War erupted in April 1861, the twelve batteries of the 4th U.S. Artillery were spread out across the continental United States. The regimental headquarters was simply an administrative body, without any tactical responsibilities. With the exception of two batteries (D and L) stationed at the Artillery School of Practice at Fort Monroe, Virginia, the remainder were posted in far-flung garrisons west of the Mississippi River. Batteries A, B and C garrisoned Fort Crittenden, Utah Territory. With the advent of hostilities, Batteries A, B, C, F, and K headed east and served with the Army of the Potomac. Part I of this article will examine the experience of Battery A at Gettysburg, and especially its distinguished service during Pickett’s Charge on 3 July 1863. Part II will examine the demographics of every officer and enlisted man assigned to the battery during July 1863. The information for this part has been gained after an extensive study at the National Archives of the relevant muster rolls, regimental returns, service and pension records of the soldiers assigned to the unit that July. This is a remarkable human interest story of a Regular Army artillery battery in the third year of the Civil War. Throughout the early part of the war, Battery A was combined with Battery C, 4th U.S. Artillery. Immediately after the Battle of Antietam in September 1862, the two batteries were separated and Battery A was ordered to Washington, DC, on 19 October to be equipped with six 3-inch Ordnance rifles. Made of wrought iron, the tube of the Ordnance rifle was 820 pounds. The effective range was 1,830 yards (at five degrees elevation). The 3-inch Ordnance rifle was an excellent weapon for long-range work, but it was also capable of firing canister, the close-range, anti-personnel rounds that functioned like a large shotgun shell. After the poor use of artillery at the Battle of Chancellorsville in early May 1863, the artillery of the Army of the Potomac had been completely reorganized. On 12 May, by Army of the Potomac Order No. 129, all the artillery batteries were organized into fourteen artillery brigades. Each brigade was under the command of an artillery officer, assisted by a small staff. The seven infantry corps were each assigned an artillery brigade, and the cavalry corps received two horse artillery brigades. The artillery brigade commanders, also functioning as chiefs of artillery, reported directly to and were responsive to their respective corps commanders. The remaining five brigades were grouped together into an army-level artillery reserve that was commanded by Brigadier General Robert O. Tyler, who reported to Brigadier General Henry J. Hunt, the Army of the Potomac’s Chief of Artillery. The reserve brigades could be temporarily assigned to an infantry corps or deployed independently wherever they were needed. Battery A, 4th U.S. Artillery, temporarily commanded by First Lieutenant Alonzo Cushing at Gettysburg, was assigned to the artillery brigade attached to II Corps. Lieutenant Cushing was only twenty-two years of age, yet seemed much younger. To one of his corporals, he “looked more like a schoolgirl than a warrior, but was the best fighting man I ever saw.” Captain John G. Hazard, a very able Rhode Island Volunteer artillery officer, commanded the brigade. Also assigned were four other batteries: Captain William A. Arnold’s Battery A, 1st Rhode Island Artillery; First Lieutenant T. Frederick Brown’s Battery B, 1st Rhode Island Artillery; Captain James M. Rorty’s Battery B, 1st New York Artillery; and First Lieutenant George A. Woodruff’s Battery I, 1st U.S. Artillery. For the coming campaign, Captain Hazard could count on a total of twenty-six guns in his brigade: twelve 3-inch Ordnance rifles, ten 12-pounder Model 1857 Napoleon smoothbores, and four 10-pounder Parrott rifles. The Union Army’s field artillery was divided into mounted artillery and horse artillery. The mounted artillery supported the infantry units. The horse teams were mounted by three drivers, and the cannoneers walked alongside each gun. In the horse artillery, every soldier in the battery was mounted in order to keep pace with the cavalry. Organizational tables for the mounted artillery authorized a crew of sixteen men to serve each gun and drive the horses that pulled the limbers and caissons. Each gun was moved by attachment to a limber, a two-wheeled vehicle with an ammunition chest, and pulled by three two-horse teams. A second limber, also pulled by six horses, had an ammunition chest and towed a caisson, also a two-wheeled vehicle with two more ammunition chests and a spare wheel. Each chest, depending on the caliber of the gun, contained thirty-two to fifty rounds. Two guns together made up a section, and a battery was composed of three sections for six guns. A six-gun battery, at full strength, had five officers: a battery commander, a lieutenant for each section, and a fourth lieutenant to command the caissons. Enlisted personnel included twenty noncommissioned officers and 130 privates. Six guns, twelve limbers, six caissons, twenty-four ammunition chests with 768 rounds of ammunition making up the basic load, plus one battery wagon and a forge, formed the equipment load. At least 110 horses were needed to move the equipment and support vehicles. During the latter part of June 1863, the Army of the Potomac shadowed General Robert E. Lee’s Army of Northern Virginia as the Confederates marched into Maryland and Pennsylvania. Battery A departed its camp in Falmouth, Virginia, on 15 June. They exchanged fire with Confederates at Thoroughfare Gap, Virginia, ten days later, expending twenty-eight rounds, but suffering no casualties. They crossed the Potomac River at Edwards Ferry, and marched via Frederick, Maryland, to Union Town, and on to Gettysburg. The total distance marched was 162 miles. 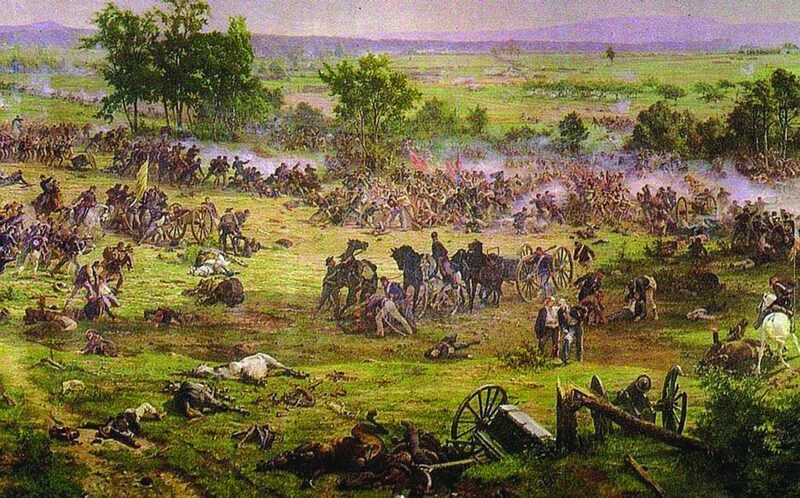 The two armies collided in a meeting engagement at Gettysburg on 1 July. At dawn on the following morning, Major General Winfield Hancock’s II Corps arrived on the field and began filing into the fishhook-shaped line from East Cemetery Hill, along the narrow Cemetery Ridge, south to Little Round Top. 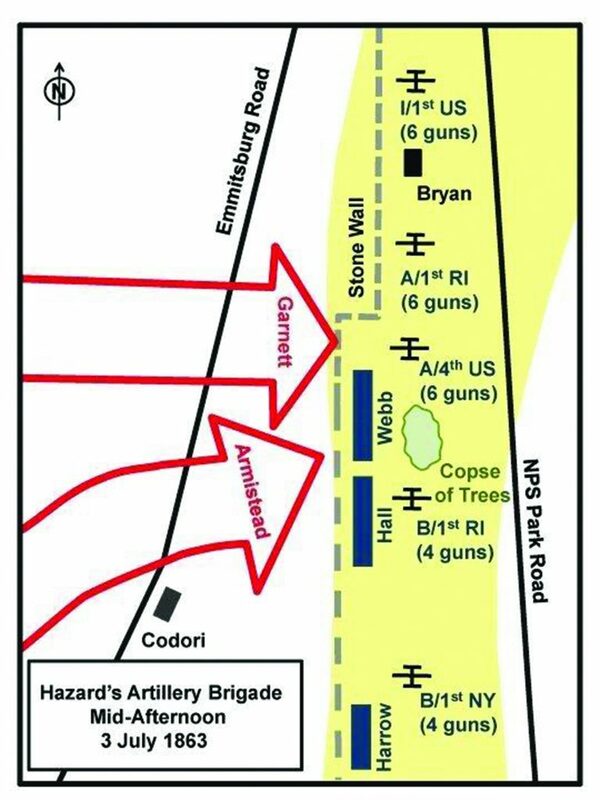 Hazard’s artillery brigade deployed in the center of the Federal line to support Brigadier General John Gibbon’s infantry division. Battery A, 4th Artillery, unlimbered in the corner of an angle formed by a low stone wall, enclosing a small copse of oak trees. The five batteries covered a position 650 yards long. At about 1600 on 2 July, Confederate Lieutenant General James Longstreet unleashed his sledgehammer attack on the Federal left flank centered on the Peach Orchard. Two hours later, Brigadier General Richard Anderson’s division of the Confederate III Corps stepped off from Seminary Ridge toward the Federal center. Leading the way were the 1,400 Georgians of Brigadier General Ambrose R. Wright’s brigade. They came under a devastating artillery fire from three Federal artillery batteries, including Cushing’s, around the copse of trees. Just behind Wright marched the 1,300 Mississippians of Brigadier General Carnot Posey’s brigade. Brigadier General William Harrow’s Federal brigade unleashed a number of volleys as the Confederates crossed the Emmitsburg Pike. The Confederates drove the Federal infantry from the Pike and then chased them over the stone wall. Lieutenant Brown’s gunners of Battery B, 1st Rhode Island, switched to double loads of canister, but they were soon overrun. Cushing’s and Arnold’s Battery A, 1st Rhode Island, cannoneers pivoted their guns and hammered the Georgians with canister. The Southerners suffered shocking casualties as more Federal infantry closed in. Posey’s brigade offered no appreciable support, and Wright’s attack soon fizzled. Both Lieutenant Brown and First Lieutenant Samuel Canby of Cushing’s battery were severely wounded in this action. The morning of 3 July was quiet until about 0800, when the enemy suddenly opened fire on the Federal center, exploding three limbers belonging to Battery A, 4th Artillery, but otherwise causing little loss. Little reply was affected, save by Lieutenant Woodruff’s Battery I, 1st U.S. Artillery, which had eight separate counterbattery engagements with the enemy before noon. At about 1300, the Confederates opened with more than twenty batteries on the Federal line. By 1445, that fire had silenced Lieutenant Brown’s battery and most of Cushing’s guns. This concentration heralded the assault which has come to be known as Pickett’s Charge. In preparation for that assault, Captain Andrew Cowan’s 1st New York Independent Artillery Battery from the Artillery Reserve was ordered up to replace Brown’s battery. The Federal batteries did not reply at first in order to conserve ammunition, by order of Brigadier General Hunt. Having subsequently returned fire, however, all their ammunition was soon expended except for canister. Captain Rorty was killed and First Lieutenant A. S. Sheldon was severely wounded in this exchange. Both officers were with Battery B, 1st New York Artillery. The Confederate infantry left the line of woods on Seminary Ridge at approximately 1500 and moved across the Emmitsburg Pike. As the Rebels approached to within 400 yards, the Federal gunners opened up with canister. With most of his guns disabled, Cushing rolled his two remaining guns down to the stone wall as the Confederates began crossing the pike. He was wounded in the shoulder and groin when a shell blew up one of his limbers during this action. Eventually, the Virginia brigades of Brigadier Generals Richard B. Garnett and Lewis A. Armistead swept over the stone wall in front of Cushing. He ordered First Sergeant Frederick Füger to switch to double and triple canister, calling out, “I will give them one more shot!” The canister rounds tore huge swaths in the advancing Confederate lines. As the Rebels swarmed into what was left of the battery, Cushing fell mortally wounded into Füger’s arms with a shot to the head. Füger caught his young commander and gently lowered him to the ground. After directing several cannoneers to carry Cushing’s body to the rear, Füger took command, leading his few remaining men in hand-to-hand combat with handspikes and rammers to protect the guns. Second Lieutenant Joseph S. Milne, temporarily attached to the battery from Battery B, 1st Rhode Island, for the campaign, was mortally wounded by a musket shot through the lungs. He died on 10 July. As the fight climaxed, Brigadier General Alexander Webb’s brigade and Federal infantry reinforcements closed in to kill, wound, or capture any Confederates who had managed to enter the Angle. The rest trudged back to their lines on Seminary Ridge. In the immediate aftermath of the battle, the battery was withdrawn from the line and temporarily consolidated with Battery I, 1st U.S. Artillery. 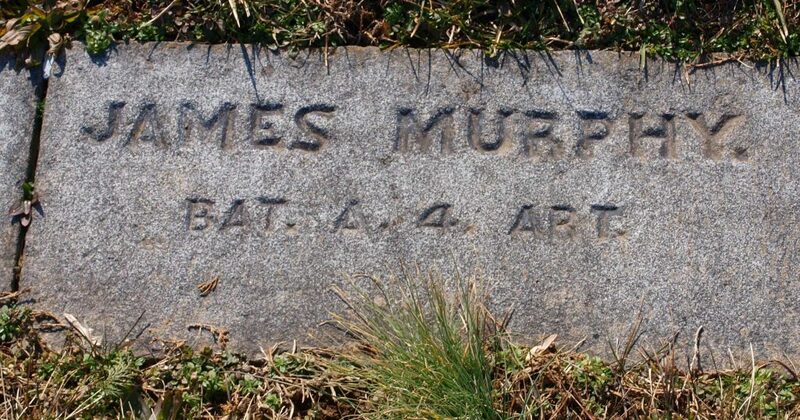 Battery I’s commander, First Lieutenant George Woodruff, had been mortally wounded and replaced by Second Lieutenant Tully McCrea. Battery A lost eighty-three of its ninety horses on the field. The battery was later transferred to serve in the 1st Horse Artillery Brigade of the Army of the Potomac’s Cavalry Corps in 1864. Battery A, 4th U.S. Artillery, was representative of regular batteries at the outset of the war, and was certainly indicative of the turbulence, constant changes, and requirement to recruit among state volunteer regiments by mid-war. The battery had only sixty-seven enlisted men on the rolls at the end of December 1860, and its strength would drop to just forty-two in September 1862. 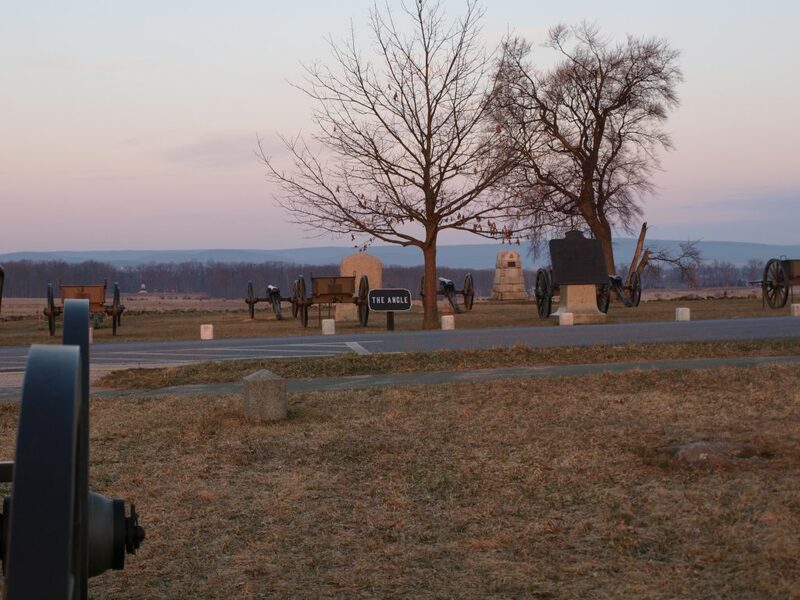 At Gettysburg, only thirty-one of these “Old Army” regulars would still be with the battery. With a crew of sixteen men needed to serve each gun and horse team, Battery A was clearly incapable of performing its mission in late-1862 after its separation from Battery C. To remedy the manning crisis experienced by all regular regiments, Secretary of War Edwin M. Stanton signed General Order No. 154 in October 1862. The order authorized commanders to recruit the “requisite number of efficient volunteers” needed to fill their units to full strength. Those selected would only be obliged to complete the remainder of their original three-year enlistments in state regiments. The acting battery commander, First Lieutenant Rufus King, stated he “had the pick of men” from the volunteer regiments encamped around Harpers Ferry, Virginia (now West Virginia), in October 1862, and selected only “good sound men.” First Sergeant Frederick Füger recalled that hundreds of volunteers applied, but only those in the best physical condition were chosen. The success of this effort was evident by the fact that on 19 October 1862, 122 signed up to transfer. Most had answered Lincoln’s first call for three-month volunteers in 1861 and reenlisted for three years when that term expired. Many were combat veterans who first “saw the elephant” at First Bull Run in July 1861, and experienced combat again during the Peninsula campaign and Antietam in 1862. Despite a reputation for strict discipline in the regulars, some of these men were glad to be out of the infantry. The loss of such good men hit the Volunteer regiments hard. Commanders and governors appealed to Secretary Stanton, who was forced to curtail the practice and limit the number of men who could be transferred from any one Volunteer company to ten. He finally rescinded the entire program in February 1863. Lieutenant Cushing reported a total strength of four officers and 146 enlisted men in the battery at the end of June 1863. Extra duties, detachments, sickness, and soldiers absent without leave resulted in only one officer and 132 enlisted men available for duty at Gettysburg. Records do not contain a roster of the men who were actually present for the battle. The assigned battery commander, Captain Charles H. Morgan, was detached and served as chief of staff for the II Corps with the Volunteer rank of lieutenant colonel. 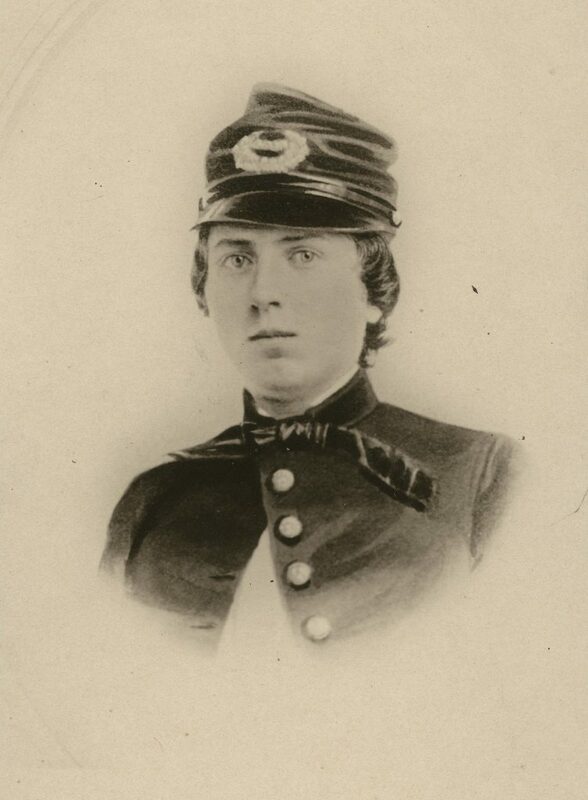 First Lieutenant Rufus King had fallen ill in late May 1863, and Second Lieutenant Arthur Morris was assigned as an aide-de-camp for his father, leaving Lieutenant Cushing as the sole officer and acting battery commander. 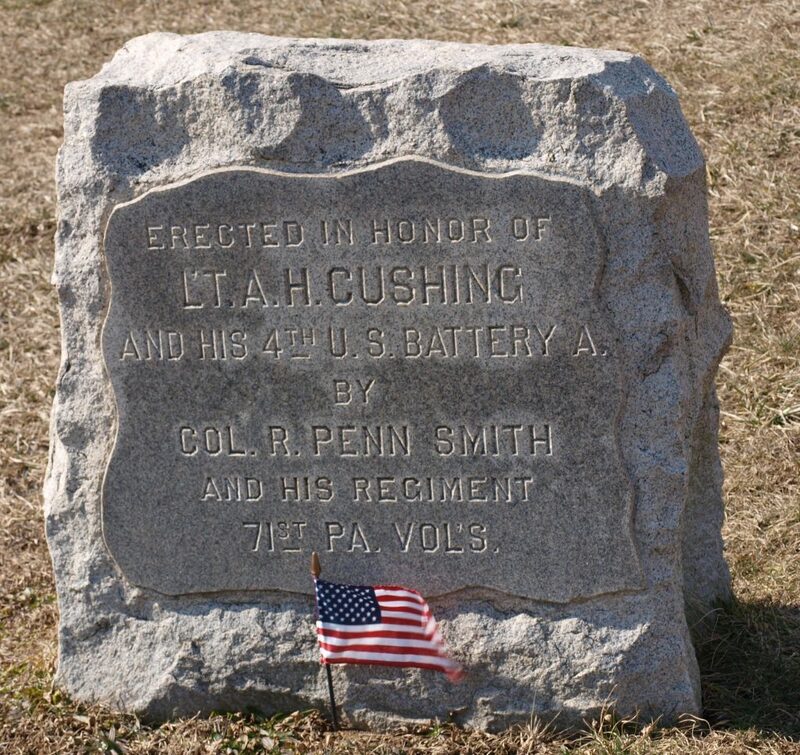 Cushing, a native of Wisconsin, was appointed to the U.S. Military Academy (USMA) from New York. He graduated twelfth in a class of thirty-four in June 1861 and was commissioned as a first lieutenant in the artillery. Following his death at Gettysburg and burial at West Point, he received a posthumous brevet promotion to lieutenant colonel. There were 115 of the October 1862 Volunteer transfers still in the battery at the end of June, representing fifteen different state regiments including the 14th Indiana; 19th and 20th Massachusetts; 5th New Hampshire; 52d, 57th, 61st, 63d, 66th and 88th New York, and 14th New York Independent Battery; 53d, 81st and 116th Pennsylvania; 4th Ohio; and the 7th Virginia Volunteers. The largest contingent—thirty-nine men in all—came from the 4th Ohio. Pennsylvania and New York regiments contributed thirty-eight and twenty-seven men, respectively. Two officers and fifteen enlisted men were attached to the battery to fill the shortages in leaders and cannoneers. First Lieutenant Samuel Canby of Battery M, 4th Artillery, and Second Lieutenant Joseph Milne of the 1st Rhode Island Light Artillery, each commanded a two-gun section. Four Ordnance Department mechanics were attached, and the gun crews were augmented by three men from the 19th Maine Volunteers, seven from the 1st Minnesota Volunteers, and one soldier from 2d Company, Minnesota Sharpshooters. The Minnesota soldiers would suffer casualties far out of proportion to their numbers with one man killed and four wounded. Typical of pre-war Regular Army units, over two-thirds of enlisted men on the rolls in December 1860 were immigrants, mostly from Ireland and Germany. By June 1863, the demographic makeup of the battery had reversed and nearly sixty percent of the enlisted men now claimed birth in the United States. Pennsylvania was home to the most with twenty-eight, while Ohio provided twenty-three and New York nineteen. The Irish remained the most numerous of foreign-born soldiers in 1863 with thirty-three men. Germans were next with twelve. Seven men claimed origins in England and Scotland. Over thirty different civilian occupations were listed in 1863, with farmers and gardeners (forty-three) and unskilled laborers (forty-two) as the most common, followed by shoemakers (seven) and carpenters (seven). The seven noncommissioned officers present at Gettysburg were exclusively pre-war regulars, and all were immigrants. Two of the corporals would be wounded in the fight. First Sergeant Frederick Füger was born in Göppingen, Germany, in 1836. He came to America in 1853 and enlisted in Battery A in August 1856. In the pre-war years, he served in Florida and Kansas, and participated in the Utah Expedition in the spring of 1858. In the summer of 1860, he commanded a detachment of fifteen men defending an outpost in the Nevada Territory. They were surrounded by about 150 hostile Indians who attacked their position repeatedly over an eleven-day period. During the early years of the Civil War, he was wounded at White Oak Swamp and Antietam. Füger initially commanded the center section of the battery at Gettysburg, and took command when Cushing was mortally wounded and the two lieutenants went down. For his exploits, he was commissioned a second lieutenant on 31 October 1863, and commanded the battery for the rest of the war. He was later awarded the Medal of Honor on 1 July 1897 for his gallantry at Gettysburg. He eventually served in the Army for forty-four years, retiring as a major on 18 June 1900. While on the retired list, he was promoted to lieutenant colonel. Sergeant Louis Blochinger, a native of Alsace, France, enlisted in July 1856. He reenlisted for a three-year term less than a week after Gettysburg, and was promoted to replace Füger as first sergeant. He remained in that position until discharged on 10 July 1864. He settled in Pittsburgh, Pennsylvania, with his wife until his death in July 1874. Sergeant Thomas Whetstone, from County Kerry, Ireland, enlisted on 15 August 1860. By all accounts, Whetstone performed admirably at Gettysburg and reenlisted in July 1864. For unknown reasons, however, he deserted less than two months later at Camp Barry, Washington, DC. His wife, a dressmaker living in Asbury Park, New Jersey, applied for a pension in 1907, but it was rejected due to his desertion. Sergeant Angus Brennan, promoted from corporal on 1 May 1863, was from Ontario, Canada. He enlisted at Buffalo, New York, in August 1858. He was discharged one month after Gettysburg when his original five-year enlistment ended, but he enlisted a year later in the 1st New Hampshire Volunteer Heavy Artillery, where he served in the defenses of Washington until the end of the war. Corporal Charles Au, from Baden, Germany, enlisted in September 1856 and reenlisted on 3 July 1861. Au was shot through the neck at Antietam in September 1862 and lost part of two fingers on his right hand at Gettysburg. Discharged in July 1864, he enlisted in October in the 55th Ohio Volunteers as a substitute for a drafted man until he was mustered out the following July after the war ended. He enlisted again in April 1866 in Battery D, 1st U.S. Artillery, and reenlisted again in July 1870 for the Artillery Detachment at USMA. Au was confined to quarters for most of his last enlistment, suffering from severe rheumatism and cared for by his wife, Ellen. He was discharged in August 1872, three years early, and filed for a disability pension in 1874. He died on 26 February 1889. A machinist from Waterford, Ireland, Edmund M. Hurley was twenty-one when he enlisted in April 1860. He was promoted to corporal on 1 May 1863, replacing Angus Brennan. At Gettysburg, Hurley was shot through the left side below the ribs and was hospitalized until mid-November 1863. Hurley’s bravery under fire was noted by Brigadier General Webb who recommended him for promotion. Transferred to Fort Washington, Maryland, in December 1863, he was hospitalized for an enlarged heart and was discharged on 22 June 1864. The examining surgeon noted that, in his opinion, Hurley’s heart ailment was caused by “intemperate habits” rather than any connection to wounds. Hurley applied for a disability pension in July 1864 which was rejected. He reapplied in 1888, and finally received his pension in 1889. Corporal Patrick Manley, from Ontario, Canada, was attached to Hazard’s II Corps Artillery Brigade in May 1863 as acting quartermaster sergeant. He was present at Gettysburg, but not with Battery A. Manley was discharged in August 1863 when his five-year term of service ended. He reenlisted in March 1864, but deserted one year later. Casualties on those two days of combat for Battery A were indeed heavy. First Sergeant Füger described the desperate hand-to-hand fighting around the guns on the afternoon of 3 July. After the battle, survivors of the battery counted over 600 dead Confederates in and around the Angle. Writing years after the war, Füger claimed that the battery sustained sixty percent casualties. A survey of records revealed forty men as casualties on both days. All the officers were killed or wounded, seven enlisted men were killed or mortally wounded, twenty-nine enlisted men were wounded, and one enlisted man was reported missing in action. Two soldiers were killed on 2 July. They were Private Andrew F. Missimer of Pottstown, Pennsylvania, and Private Sylvester Brown from Minnesota. Of the enlisted soldiers killed or mortally wounded on 3 July, four (Lance Sergeant James Murphy and Privates William Patten, Jr., Martin Scanlon, and Ansel Fassett) are buried in the Regulars’ Section of the National Cemetery at Gettysburg. Private Hiram A. Griffin’s death provides a horrific story. Griffin originally enlisted in the 61st New York Volunteers. He was badly wounded at Fair Oaks in June 1862, but recovered to transfer into Battery A in October 1862. After this wound, he swore that should he ever be seriously wounded again, he wanted his fellow artillerymen to put him out of his misery. During the artillery exchange that afternoon, a shell crashed into a horse and exploded, disemboweling the animal and mangling the driver, Private Griffin, who was seated in the saddle. As he writhed in agony, he called out for someone to shoot him. Then methodically, Griffin pulled his own revolver and put it to his head. “Goodbye, boys,” he said, and shot himself. Seven soldiers were wounded on 2 July. Two of those men, Privates Frederick Ensign and Adam Shriner, later deserted. Shriner had reenlisted on 13 February 1864, but deserted on 10 May 1865. The charge of desertion was removed by an 1889 Act of Congress, and he was honorably discharged in 1892 to date from 10 May 1865. He died on 3 October 1915 at Traverse City, Michigan. Of the twenty-two soldiers wounded on 3 July, four had previously been wounded. Privates Henry Burtruff and Charles L. Hubbs had both been wounded at First Bull Run on 21 July 1861. Private Andrew Eagan was wounded at Glendale on 30 June 1862, and later at Bristoe Station, Virginia, on 14 October 1863. Discharged in November 1863, he lived a long life, finally passing away in August 1891 in Fulton, Illinois. Private Charles Morrison originally enlisted in the 81st Pennsylvania Volunteers on 22 August 1861. He was shot in the face at Glendale on 30 June 1862 but recovered quickly. At Gettysburg, his left leg was injured when a caisson exploded and he was knocked to the ground and run over. Morrison was committed to an asylum in 1880, and died on 22 November 1895 in Danville, Pennsylvania. The events of 3 July undoubtedly shattered the manpower and equipment of Battery A which lay in the apex of Pickett’s Charge. However, this cohesive unit rapidly recovered and continued to render distinguished service for the balance of the Civil War. 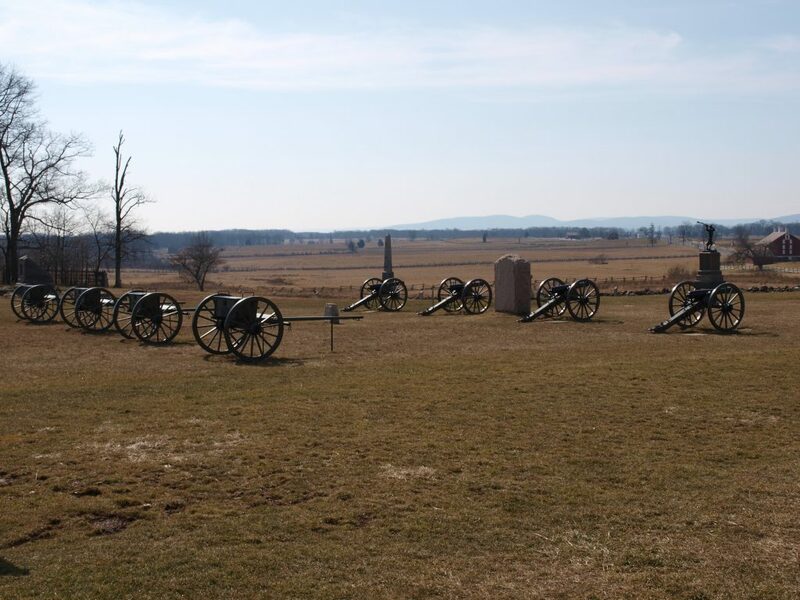 At Gettysburg, it exemplified the 4th Field Artillery’s current motto, Nulla Vestigia Retrorsum (No Step Backwards).